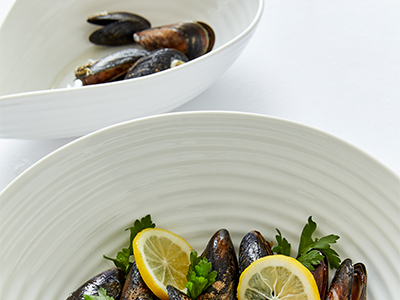 Designed for modern day living, Portmeirion’s tableware is ‘Oven-to-Table’ and dishwasher safe. It has been designed to perform at temperatures normally used when cooking – Porcelain tableware up to 200°C / 400°F / UK Gas Mark 6, Earthenware tableware 170°C / 340°F / UK Gas Mark 3 and in microwaves (providing the dish is at least ½ full with food or liquid). It can even go from freezer to oven (providing the dish is at least ½ full with food or liquid). Try to heat tableware items gradually. Don’t place empty ware into a microwave or hot oven. Make sure it contains some food or liquid. Don’t place your tableware onto a direct source of heat such as a hob. 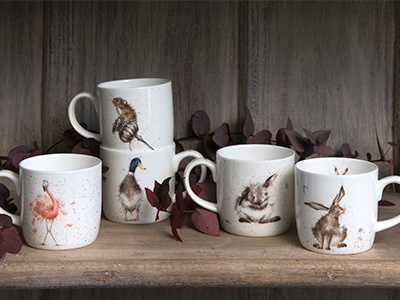 All Portmeirion’s earthenware and Porcelain tableware is easy to clean either using a dishwasher or by hand using conventional hand-wash detergents. Portmeirion’s cutlery items such as cake slices, teaspoons and pastry forks are made from stainless steel and have beautiful porcelain handles. We always recommend that these are hand washed in mild soapy water and dried with a soft cloth. Our textiles are made from excellent quality materials and are designed for everyday use. As with all textiles, wear and tear will occur so we recommend that they be washed at 40° and spun at 1000rpm, but of course, if you want to save a little energy, all our textiles can be washed at 30°. Be sure to wash similar colours together. 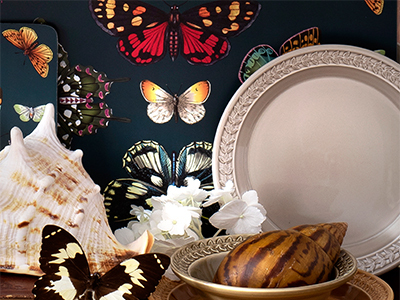 Our placemats and coasters are brought to you by our sister brand Pimpernel. Using the highest quality materials, these placemats and coasters provide a durable surface to protect surfaces from heat, scratches and staining. 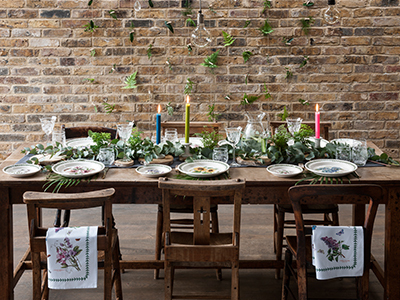 All placemats and coasters in the Pimpernel collection are made using an unrivalled layering system with a cork base, hardwood middle, fantastic design and protective, hard-wearing surface. Designed for everyday living, our placemats and coasters are resistant to normal household stains and withstand temperatures up to the boiling point of water. They are not suitable for use as chopping boards. All trays are heat resistant with a wipe clean surface. Our toughened glass lid is super strong, conveniently transparent and oven safe to 180°C/355°F. However, glass can break under certain circumstances. Please read the following instructions to prevent damage. Avoid placing the glass lid directly on a hot-plate, as this greatly reduces breakage resistance. Use only plastic or wooden utensils. Avoid extreme temperature change when using the lid. Avoid using scouring pads or harsh abrasives to clean your lid, as this may scratch the glass surface and reduce its breakage resistance. If you clean your cookware in the dishwasher you may notice the base discolours over time; this is a chemical reaction between the dishwasher salt and the aluminium. Using too much salt can accelerate the reaction and soot could form, we recommend that you follow your dishwasher manufacturers’ guide for salt addition. This discolouration will not affect the performance of your cookware. Portmeirion’s candles have undergone an exhaustive testing programme in order to ensure that they meet the highest quality and safety standards. As with all candles, there are guidelines that need to be followed to ensure your safety. Always read the safety/burning information that accompanies the candle before lighting. Keep this information for future use. Remove all outer packaging before lighting. Do not place candles in direct sunlight or on/near a direct heat source such as a fire or radiator as this can affect the way the candle burns. Remember that electrical items like television sets also get hot and therefore should be treated as a source of heat. Candles should always be placed 10cm apart form each other. Keep the candle away from flammable materials like curtains, bedding, clothing and hair, and allow adequate space above the candle for the heat from the flame. Candles shouldn’t be burned in a draught as this can cause them to burn unevenly. Place candles on a flat and stable surface so that they cannot fall or be knocked over. Before lighting ensure the wick is trimmed to 0.5cm. If the flame becomes too large extinguish it, allow it to cool and the wax to harden, and trim the wick. Never leave a burning candle unattended or fall asleep. Do not touch or move the candle when it is alight or hot. When extinguishing a candle be aware of the flame and the hot wax. Using a candle snuffer is preferable. Do not allow foreign objects such as spent matches to fall into the candle. For tealight holders, never touch the tealight or holder when the candle is lit and wait for the holder to cool before moving.